I know, Pokémon Go is popular right now, but even taking its massive launch into account I haven’t seen anything quite like these events that went down in Australia over the weekend. 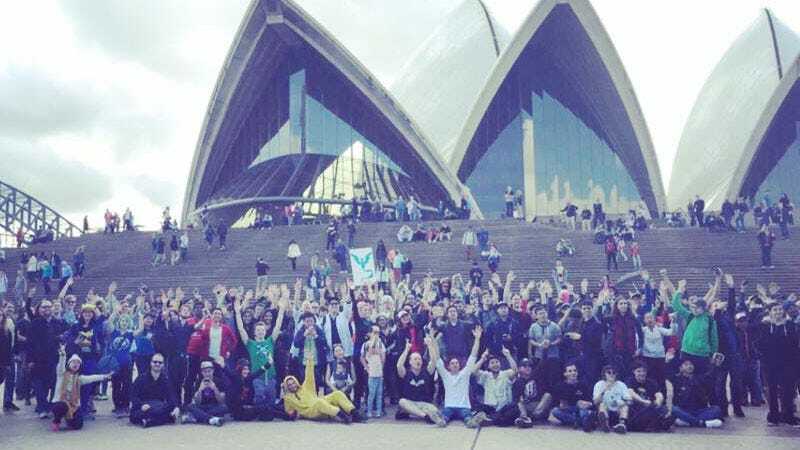 The Pokémon Go Walk in Sydney, hastily advertised on Facebook in the wake of the game’s launch, was intended by PAX Australia’s Guy Blomberg to be a little meet-and-greet, maybe a fun day in the sun. Instead, the above happened. Blomberg says at least 2000 people turned up (the image up top is just a sample, as the party was spread across the parks adjacent to the Opera House, as you’ll see below). Sure, we’ve seen groups of people running into each other outside bars and in parks, but this is nuts. There was also a Pokémon Go Walk held on the other side of the country, in Perth, and it was also a huge event, attracting around 1000 players. Note this is all in the middle of the Australian winter. Which, yes, I know, for many American readers is a relative term, but still.